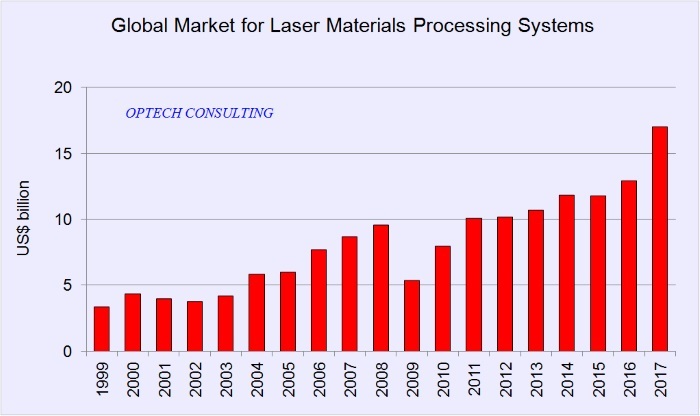 The global market for laser systems for materials processing increased by 17% in 2018 and reached the new record volume of $ 19.8 billion. Market growth in Europe exceeded 20%, outpacing growth rates in North America and China. 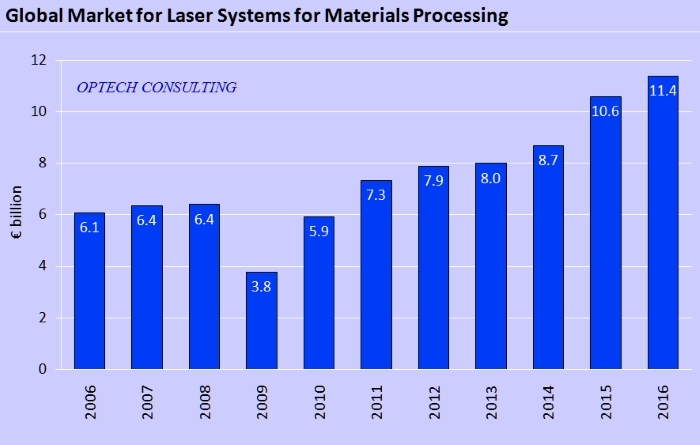 Investments in laser equipment increased substantially in Europe in line with growing capital equipment spending, defying comparably weak growth. In euros, the market reached a volume of € 16.8 billion in 2018, up 12% vs the previous year. The difference of growth rates in US$ and euros is due 4.9% appreciation of the euro vs the US$ in 2018 vs the previous year. 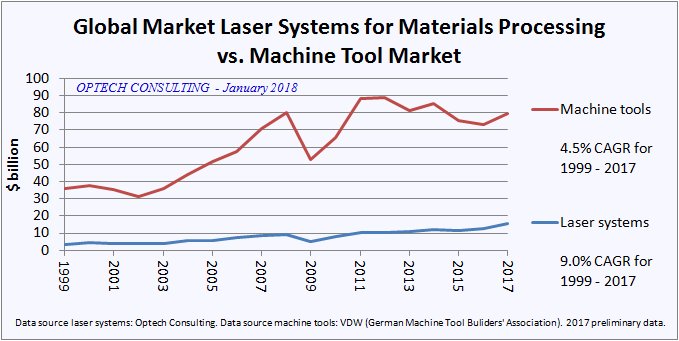 High power laser cutting and welding, which is the largest application segment of laser materials processing, once again spurred the worldwide growing demand for laser equipment. The demand for welding systems was stimulated by automotive applications, and especially by the transition of the industry to e-mobility. 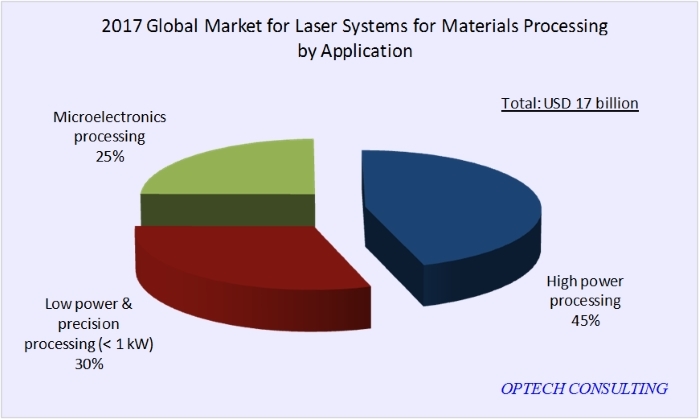 In contrast, market growth for laser applications in the electronics industry was mixed. While demand in the semiconductor segment continued to grow due to EUV and advanced packaging applications, market growth in the flat panel display segment took a dip. Due to decreased smartphone shipments mobile electronics manufacturers cut back their capital spending. 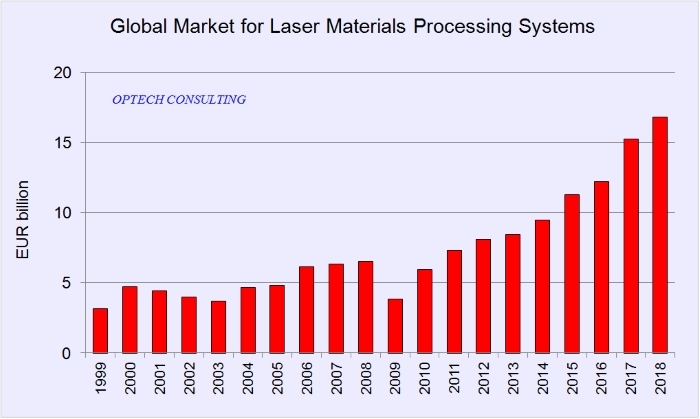 The global market for industrial laser sources reached $ 5.1 billion in 2018, up 10% vs the previous year. The growth rate falls short of that for laser systems because the average sales price for lasers decreased more than the average price for laser systems. 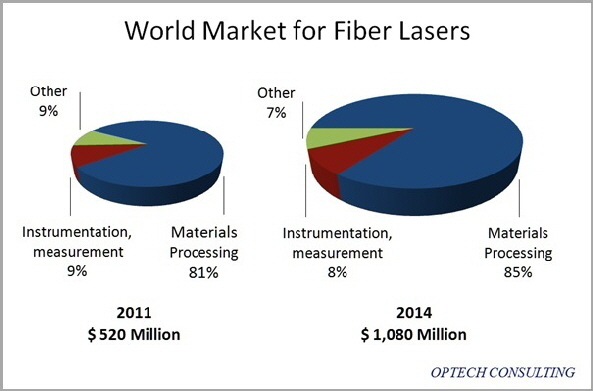 Especially high power fiber laser prices were under pressure in 2018 due to the increased number of suppliers gaining market traction by cutting prices. 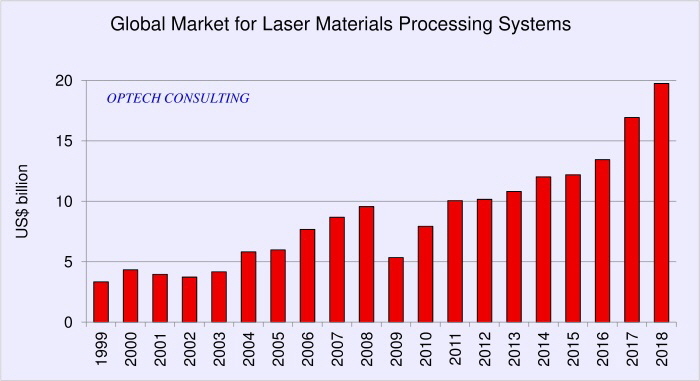 Market growth rates for laser systems as well as for laser sources were down in 2018 as compared to the previous year. 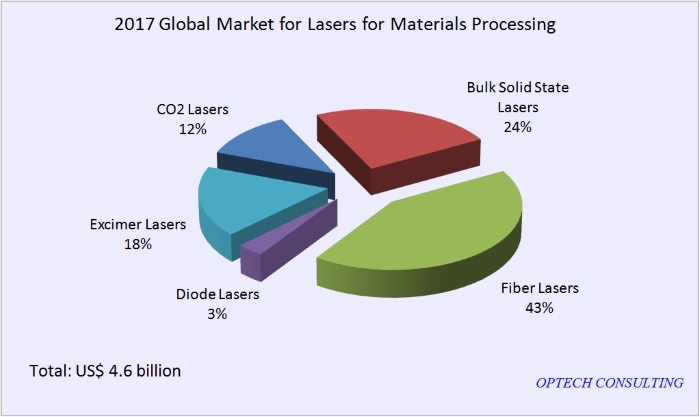 2017 was an outstanding year for laser materials processing, and in 2018 some of the drivers paused or lost steam. 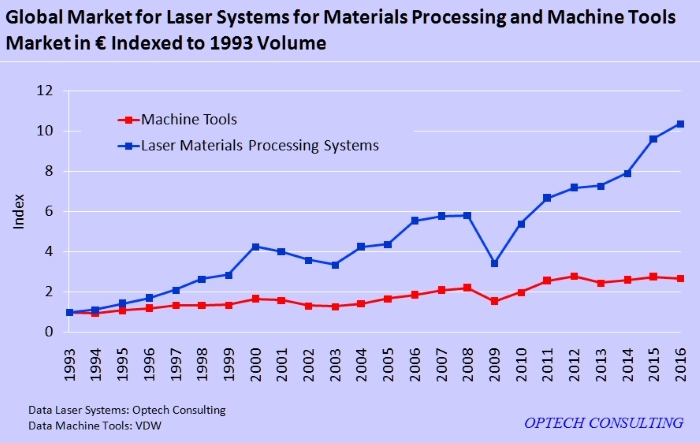 The process of laser adoption in the manufacturing industry in China continued at a slower pace. The microelectronics processing market felt the decreasing growth rates in the mobile electronics market. The decrease of car sales worldwide and especially in China spurred fears of decreasing investments in the automotive industry. 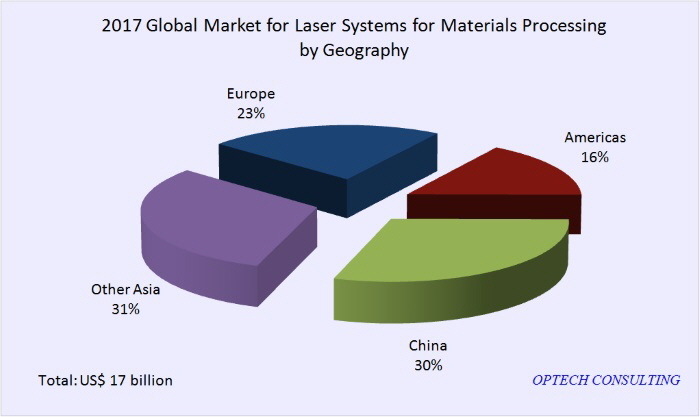 Most visibly, the US-China trade row was often cited as a major reason for the slowdown of growth in the industrial laser market. 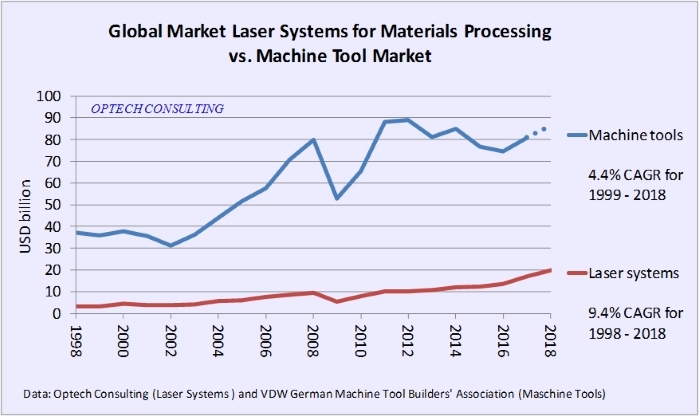 While the direct impact of the dispute on the laser market appears to be small, it also has an indirect impact by creating investment uncertainties and by slowing down global economic growth. During the course of the year 2018, market growth rates versus the previous year increasingly weakened, and the trend continued into the first quarter of 2019. However, as the first quarter is seasonally weak, we wait for further data before setting up a 2019 market forecast. We will present the next market update at the 14th International Laser Marketplace. 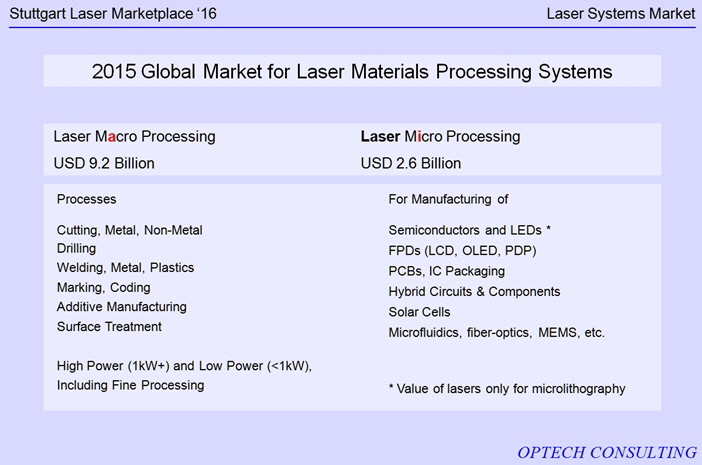 The 14th International Laser Marketplace will be held on 26th June 2019 in Munich, Germany, in conjunction with the Laser World of Photonics trade show. Definitions - A "laser source" is a laser. A "laser system" is a system (machine) including a laser. Exceptions - For microlithography we count the DUV or EUV light source as the system. We do not include the full value of the wafer stepper/scanner. For FPD annealing we count the laser source and the projection optics as the system. The following diagrams show historic market data.